The latest 12-cylinder grand turismo automobile in Ferrari’s prancing stable, the F12 or F12berlinetta is a marvel of design and technology. It is a bit smaller on all axes than the 599, lighter yet more stiff, with a lower center of gravity and 54% of the weight balanced over the rear drive wheels. It has been engineered to do the two things a GT car must do — go fast, and be comfortable and easy to use for long distances — extremely well. 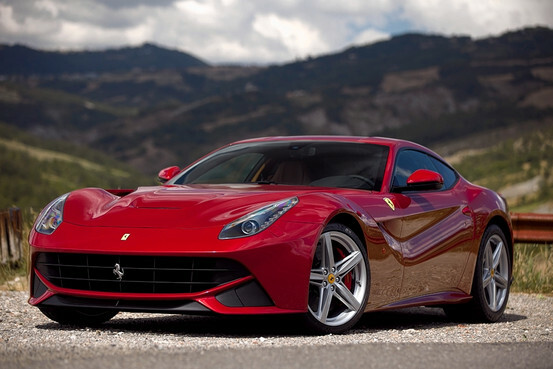 The F12 is powered by a 6,262cc 65 degree V12 — the same motor from their FF — which produces 730hp and 509 ft-lbs. of torque. All this power is channeled through the 7-speed dual-clutch, automated semi-automatic gearbox operated by ‘paddles’ behind the steering wheel, and can push the F12 from 0 to 60 in 3.1 seconds and up to 210 mph.. A notable feature is the Aero Bridge, an air channel running from the bonnet, through the flanks and along the sides of the vehicle, creating an effect that increases downforce to 270 lbs at 120 mph. Another feature is Active Brake Cooling ducts, which open to direct cooling air only when the brakes are hot. The car is a two seater, with new “Frau leather” upholstery with aluminium, Alutex, and carbon fibre trim, and also has increased luggage space compared to the 599. GM Information: The F12 receives a +1 to Quick Turn and any braking maneuvers. The FF premiered many of the technologies of the F12berlinetta. The engine is the same as the F12, the transmissions are similar. It is a four seater, with fold-down rear seats and a “shooting brake” configuration (it’s a hatchback), that gives it good carrying volume — between 16 and 28 cu. ft. — for distance travel. GM Information: The FF gains a +1 EF to Pursue/Flee tests.